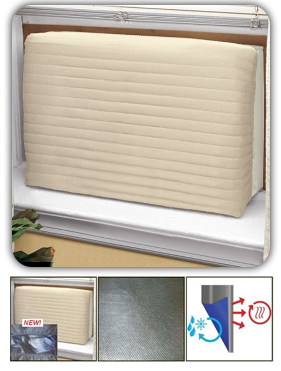 NEW SUPER COVER™ is truly the highest quality indoor insulated window air conditioner cover or through the wall air conditioner cover currently available. Light beige color with a consideration towards most interior color schemes. Truly a beautiful, high quality product for the home or business. As of November 12, 2011, introduced as the industry’s newest and most improved indoor insulated Window / Through the Wall air conditioner cover available on the market!Laboratory tested lining produces 95% reflectivity of outside cold air and indoor warm air loss and with what has to be the highest level of resistance to heat loss currently available in an Indoor Window / Through the Wall air conditioner cover on the market today. R-Value represents the level of insulation's resistance to heat flow. 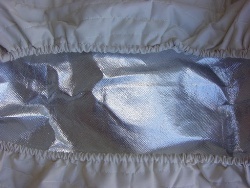 70% Polyester and 30% Cotton fabric with pile insulation plus NEW 95% reflective Radiant Barrier lining. Our covers are sold nationally to thousands of homeowners, businesses and institutions which have window air conditioners or through the wall air conditioning units. 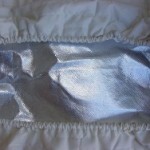 Feel free to call 303.438.0906 or Email Us for a price for custom made to size extra large indoor insulated Super Covers. We will need the width, height and depth measurements of the indoor portion of your window/through the wall air conditioner. Insulated Window air conditioner unit side panels - Custom made warm insulated window air conditioner unit side panel inserts. Place them on each side of your window air conditioner. Keeps heat in and cold air out! Window and Through the Wall Air Conditioner Outside Protective Covers - Keep the cold air, dirt and dust out and protects the outside Window A/C unit. Comes with a 1/8" nylon rope tie and a FREE 1" wide outdoor nylon outdoor secure strap for additional tightening of the cover to the outside of the A/C unit.